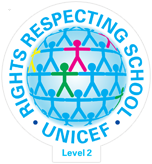 We are delighted to announce that we have recently been assessed as a Level 2 UNICEF Rights Respecting School (June 2014). What this means in practice is that we ensure the interests of the child at our school are a top priority in all our actions and that we are committed to placing the values and principles of the Convention on the Rights of the Child at the heart of our policies and practice. In practice this means that we listen to children’s views and include them in decision making from organising a charity day, to reviewing the fairness of school team selections. We also integrate the Rights of the Child into our topic teaching so that children are aware of how children’s rights are and were respected and/or neglected in history and across the world today. We hope our children develop the confidence, through their experience of an inclusive rights-respecting school community, to play an active role in their own learning and to speak and act for the rights of all to be respected locally and globally. We enlist the help of local councillors, politicians and lawyers to teach the children about their rights and responsibilities as citizens – and we visit the Houses of Parliament in Year 6! Being a Rights Respecting School also shapes our behaviour management. Every class draws up a class charter based on agreed rights, for example Article 12, “respect for the views of the child” , and then lists how adults and children will respect this right. Once behaviour is seen in this way there is little need for rules.